Wedding hair and makeup is about enhancing your natural features. A beautiful hairstyle and just the right amount of makeup will complete your bridal look. As soon as you’re engaged, you should start doing some beauty preparation to ensure your skin is ready and those locks are luscious. Use a good quality shampoo and conditioner, and regular treatments if you suffer from dry hair or scalp conditions in the lead up to your wedding. Be sure to visit your hairdresser for regular trims, even if you want to grow your hair for your wedding, so that your hair will look healthy on the day. Even if you don’t usually wear makeup, you should definitely do so for your wedding day. Every woman looks better with expertly applied, natural-looking makeup. But don’t overdo it - the idea is to look like a gorgeous you, not an artificial painted doll. Very natural looking makeup is the best choice for brides. You should aim for soft, dewy looking skin with more dramatic eyes and natural looking lips. A professional wedding hair and makeup artist is a must. As well as being able to apply makeup that enhances your best features and cover any blemishes, a professional will ensure that your makeup lasts the entire duration of your wedding day. You don’t want to look washed-out by the time you get to the reception! Try to choose a professional wedding hair and makeup artist based on recommendation. You’ll find lots of reputable wedding hair and makeup artists in our magazines and on our Supplier Directory. We use many of these professionals in our own bridal shoots so you can rest assured they can be trusted! 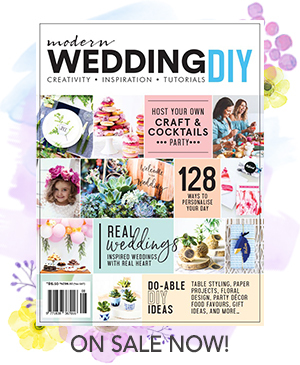 Look through magazines such as Modern Hair + Beauty for wedding hair and makeup ideas. Mark pictures where the bridal makeup or bridal hairstyles are similar to what you’re after. When you visit potential wedding hair and makeup artists, look through their portfolios to see whether their style is in line with your wishes for your wedding day. Your wedding day is the perfect occasion to try bridal hairstyles you’ve always dreamt of. Long, cascading waves, a sculpted Audrey up-style, sleek shining locks, fresh feathery curls or an intricately rolled set - there are so many beautiful bridal hairstyles to choose from. We’ve pinned over 350 bridal hairstyles on Pinterest so it’s worth checking out if you’re in need of inspiration. It’s a good idea to get your hair stylist’s advice on what will suit you. The right style will frame your cheekbones, flatter your neck, and make your eyes look amazing. The cut of your dress may also dictate your hairstyle - you don’t want stray locks caught in your beading - ouch! Are you going to wear a veil or hair accessory? Decide this before you choose a hairstyle. Most veils attach to the hair itself with pins or combs, but if your hair is fine a headband will keep your veil equally secure. Check out Bridal Headpieces and Veils on Pinterest.